FOUND. The perfect Christmas gift for anyone who loves The Muppets and the movies in general. The Muppets once again are spoofing the movies. They have been doing that all along with their trailers for the new 2011 Muppet movie, Green With Envy, and now they have taken the parody theme to the entire next year. 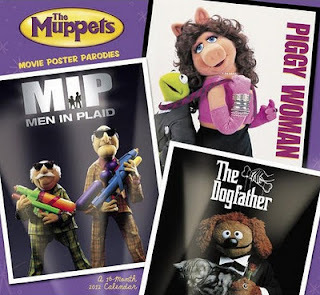 The 2012 Muppets Movie Poster Parodies calendar includes thirteen images from the movies and you are going to love it. Think The Godfather, but insert Dog at the beginning of the word and Rowlf as Marlon Brando. Think of the Sound of Music but alter the title a bit to The Sow of Music and insert Miss Piggy in the lead role. Finally, I love the image of Fozzie Bear as Tom Cruise in Mission Improbable. You will, too. View a couple more images from the calendar by clicking here or head directly to Amazon to order your copy by clicking right here. Read more about The Muppets 2012 movie parody calendar. Order your copy of The Muppets parodies calendar from Amazon.